Garrison Brewing has joined forces with the Montreal-based craft brewery Brasseurs Sans Gluten (BSG) to offer Atlantic Canadians’ a gluten-free beer option. 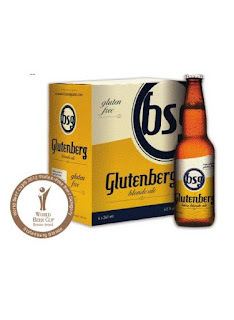 Glutenberg Blonde Ale, now available at select NSLCs, is made from the gluten-free grain millet and boasts distinct floral hops, white pepper and lemon zest aromas. It was developed over a period of one year and is one of only a few beer options for Canadians living with Celiac disease or other forms of gluten intolerance. It’s estimated that 1 per cent of Canadians are affected by Celiac Disease and many times that number has varying levels of gluten intolerance. Only in business one year, BSG has already won gold, silver and bronze at the 2012 World Beer Cup for gluten-free beers. The recipes were developed over a 12 month period and they are the only microbrewery in the country that brews and bottles their beers in a 100 per cent gluten-free environment. Glutenberg Blonde is now on sale at NSLC stores in Nova Scotia and PEILCC stores in Prince Edward Island. The process is underway to make the beer available in New Brunswick and Newfoundland and Labrador. Invite Beer Home for the Holidays! Railway City Brewing Co. is Expanding! Beer Mail from Cameron's Brewing Co.